For The Dead Milkmen album, see The King in Yellow (album). The King in Yellow is a book of short stories by American writer Robert W. Chambers, first published by F. Tennyson Neely in 1895. The book is named after a play with the same title which recurs as a motif through some of the stories. The first half of the book features highly esteemed weird stories, and the book has been described by critics such as E. F. Bleiler, S. T. Joshi and T. E. D. Klein as a classic in the field of the supernatural. There are ten stories, the first four of which ("The Repairer of Reputations", "The Mask", "In the Court of the Dragon", and "The Yellow Sign") mention The King in Yellow, a forbidden play which induces despair or madness in those who read it. "The Yellow Sign" inspired a film of the same name released in 2001. The British first edition was published by Chatto & Windus in 1895 (316 pages). These stories are macabre in tone, centering, in keeping with the other tales, on characters that are often artists or decadents, inhabitants of the demi-monde. The first and fourth stories, "The Repairer of Reputations" and "The Yellow Sign", are set in an imagined future 1920s America, whereas the second and third stories, "The Mask" and "In the Court of the Dragon", are set in Paris. These stories are haunted by the theme: "Have you found the Yellow Sign?" The weird and macabre character gradually fades away during the remaining stories, and the last three are written in the romantic fiction style common to Chambers' later work. They are all linked to the preceding stories by their Parisian setting and their artistic protagonists. Hildred Castaigne in "The Repairer of Reputations", illustration by Tucker Sherry. "The Repairer of Reputations" – A weird story of egotism and paranoia which carries the imagery of the book's title. "The Mask" – A dream story of art, love, and uncanny science. "In the Court of the Dragon" – A man is pursued by a sinister church organist who is after his soul. "The Yellow Sign" – An artist is troubled by a sinister churchyard watchman who resembles a coffin worm. "The Demoiselle d'Ys" – A ghost story, the theme of which anticipates H. G. Wells' "The Door in the Wall" (1906). "The Prophets' Paradise" – A sequence of eerie prose poems that develop the style and theme of a quote from the fictional play The King in Yellow which introduces "The Mask". "The Street of the Four Winds" – An atmospheric tale of an artist in Paris who is drawn to a neighbor's room by a cat; the story ends with a macabre touch. "The Street of the First Shell" – A war story set in the Paris Siege of 1870. "The Street of Our Lady of the Fields" – Romantic American bohemians in Paris. "Rue Barrée" – Romantic American bohemians in Paris, with a discordant ending that playfully reflects some of the tone of the first story. The fictional play The King in Yellow, has at least two acts and at least three characters: Cassilda, Camilla and "The Stranger", who may or may not be the title character. Camilla: "You, sir, should unmask." Cassilda: "Indeed it's time. We have all laid aside disguise but you." Stranger: "I wear no mask." Camilla: (Terrified, aside to Cassilda.) "No mask? No mask!" It is also stated, in "The Repairer of Reputations", that the final moment of the first act involves the character of Cassilda on the streets, screaming in a horrified fashion, "Not upon us, oh, king! Not upon us!" All of the excerpts come from Act I. The stories describe Act I as quite ordinary, but reading Act II drives the reader mad with the "irresistible" revealed truths. "The very banality and innocence of the first act only allowed the blow to fall afterward with more awful effect." Even seeing the first page of the second act is enough to draw the reader in: "If I had not caught a glimpse of the opening words in the second act I should never have finished it [...]" ("The Repairer of Reputations"). He mentioned the establishment of the Dynasty in Carcosa, the lakes which connected Hastur, Aldebaran and the mystery of the Hyades. He spoke of Cassilda and Camilla, and sounded the cloudy depths of Demhe, and the Lake of Hali. "The scolloped tatters of the King in Yellow must hide Yhtill forever," he muttered, but I do not believe Vance heard him. Then by degrees he led Vance along the ramifications of the Imperial family, to Uoht and Thale, from Naotalba and Phantom of Truth, to Aldones, and then tossing aside his manuscript and notes, he began the wonderful story of the Last King. Chambers borrowed the names Carcosa, Hali and Hastur from Ambrose Bierce: specifically, his short stories "An Inhabitant of Carcosa" and "Haïta the Shepherd". There is no strong indication that Chambers was influenced beyond liking the names. For example, Hastur is a god of shepherds in "Haïta the Shepherd", but is implicitly a location in "The Repairer of Reputations", listed alongside the Hyades and Aldebaran. Brian Stableford pointed out that the story "The Demoiselle d'Ys" was influenced by the stories of Théophile Gautier, such as "Arria Marcella" (1852); both Gautier and Chambers' stories feature a love affair enabled by a supernatural time slip. The name Jeanne d'Ys is also a homophone for the word jaundice and continues the symbolism of The King in Yellow. 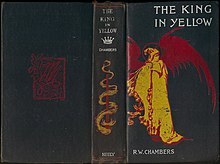 In Raymond Chandler's 1938 detective story, also titled "The King in Yellow", the protagonist says "The King in Yellow. I read a book by that title once." The first season of HBO's True Detective television series revolves around a string of crimes committed by the elusive "Yellow King" with Carcosa also being mentioned on numerous occasions. Black stars are also prominent in reference and imagery during the series. The Yung Lean song "Yellowman" references The King in Yellow, using the lyric "I'll be your yellowman, Carcosa land". 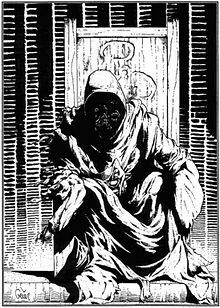 "The King in Yellow", illustration by Earl Geier in Richard Watts' scenario "Tatterdemalion" for the Call of Cthulhu role-playing game published by Chaosium. The Yellow Sign adorning the back of the throne was designed by Kevin A. Ross for the scenario "Tell Me, Have You Seen the Yellow Sign?" H. P. Lovecraft read The King in Yellow in early 1927 and included passing references to various things and places from the book—such as the Lake of Hali and the Yellow Sign — in "The Whisperer in Darkness" (1931), one of his main Cthulhu Mythos stories. Lovecraft borrowed Chambers' method of only vaguely referring to supernatural events, entities, and places, thereby allowing his readers to imagine the horror for themselves. The play The King in Yellow effectively became another piece of occult literature in the Cthulhu Mythos alongside the Necronomicon and others. In the story, Lovecraft linked the Yellow Sign to Hastur, but from his brief (and only) mention it is not clear what Lovecraft meant Hastur to be. August Derleth developed Hastur into a Great Old One in his controversial reworking of Lovecraft's universe, elaborating on this connection in his own mythos stories. In the writings of Derleth and a few other latter-day Cthulhu Mythos authors, the King in Yellow is an Avatar of Hastur, so named because of his appearance as a thin, floating man covered in tattered yellow robes. In Lovecraft's cycle of horror sonnets, Fungi from Yuggoth, sonnet XXVII "The Elder Pharos" mentions the last Elder One who lives alone talking to chaos via drums: "The Thing, they whisper, wears a silken mask of yellow, whose queer folds appear to hide a face not of this earth...". This thing with a silken mask of yellow also features in The Dream-Quest of Unknown Kadath. Although none of the characters in Chambers' book describe the plot of the play, Kevin Ross fabricated a plot for the play within the Call of Cthulhu mythos. The Secret World, a Lovecraft-inspired massively multiplayer online role-playing game, quotes Cassilda's Song and other elements from The King in Yellow during a quest. The theft of a supposed manuscript of the play The King in Yellow from the British Library forms a major plot element of Charles Stross's Lovecraft-inspired book The Annihilation Score. In Alan Moore's comic series Providence, as well as its sequel Neonomicon, Moore re-imagines the Lovecraftian mythos while referencing and borrowing heavily from The King in Yellow. The book is referenced by name throughout Providence, as well as referencing a fictional variation Sous Le Monde, French for "Under the World." In both Providence and its sequel, a recurring character named Johnny Carcosa appears as an avatar/speaker for a Lovecraftian entity, possibly Nyarlathotep or Azathoth. Game designer Robin D. Laws, having written a collection of Chamber-inspired stories entitled New Tales of the Yellow Sign, has converted the story "Repairer of Reputations" for Trail of Cthulhu. He is currently writing a Yellow King Roleplaying Game, including crossover content for the Cthulhu Mythos. ^ "The King In Yellow: First Edition Controversy". Retrieved 21 March 2014. ^ a b "Robert W. Chambers" in American Supernatural Tales. Penguin Classics. Penguin Books. 2007. p. 79. ISBN 978-0-14-310504-6. ^ Klein, T. E. D. (1986). "Chambers, Robert W(illiam)". In Sullivan, Jack (ed.). The Penguin Encyclopedia of Horror and the Supernatural. New York: Penguin/Viking. pp. 74–6. ISBN 0-670-80902-0. ^ "The King in Yellow". Internet Speculative Fiction Database. Retrieved 28 April 2014. ^ "The King in Yellow and Other Horror Stories by Robert W. Chambers - Reviews, Discussion, Bookclubs, Lists". Goodreads. Retrieved August 6, 2013. ^ "The King in Yellow" in e.g. Chambers, Robert W. (2004). The Yellow Sign and Other Stories. Call of Cthulhu Fiction. Chaosium. p. 3. ISBN 1-56882-170-0. ^ "The Mask" in e.g. Chambers, Robert W. (2004). The Yellow Sign and Other Stories. Call of Cthulhu Fiction. Chaosium. p. 33. ISBN 1-56882-170-0. ^ Chambers, Robert W. (2004). The Yellow Sign and Other Stories. Call of Cthulhu Fiction. Chaosium. p. 20. ISBN 1-56882-170-0. ^ Chambers, Robert W. (2000). Joshi, S. T. (ed.). The Yellow Sign and Other Stories. Oakland, CA: Chaosium. p. xiv. ISBN 978-1-56882-126-9. ^ Brian Stableford, "The King in Yellow" in Frank N. Magill, ed. Survey of Modern Fantasy Literature, Vol 2. Englewood Cliffs, NJ: Salem Press, Inc., 1983. (pp. 844-847). ^ Joshi, S. T.; Schultz, David E. (2001). "Chambers, Robert W[illiam]". An H. P. Lovecraft Encyclopedia. Westport, CT: Greenwood Press. p. 38. ISBN 978-0-313-31578-7. ^ Pearsall, Anthony B. "Yellow Sign". The Lovecraft Lexicon (1st ed.). Tempe, AZ: New Falcon. p. 436. ISBN 0-313-31578-7. ^ Lovecraft, Howard Phillips (1971). Fungi from Yuggoth and other poems. Ballantine Books. ISBN 978-0-345-02147-2. ^ "Providence 10". Retrieved 11 August 2018. Watts, Richard; Love, Penelope (1990). Fatal Experiments. Oakland, CA: Chaosium. ISBN 0-933635-72-9. Wikimedia Commons has media related to The King in Yellow.